More than 32000 Govt Jobs announced by different Government organisations recently around International Women's Day 2017, many of them are considered to be the best for Female Candidates aspiring for secure future as well as job security. Today, 08 March 2017, International Women’s Day is celebrated across the globe recognizing the achievements women made in social, political, cultural, economic, scientific and various other fields. As this year’s campaign theme states ‘Be Bold for Change’, we too match the theme and bring some government jobs for women that can bring change with the boldness they inherit. Women candidates who still are in a dilemma about what type of government jobs for women are available can now easily apply for 32000 government jobs for women across the nation. Some of the very well known organizations like Air Force, SSC, UPSC, PSC, Kendriya Vidyalaya, Vyapam are investing themselves in recruiting women for various posts. 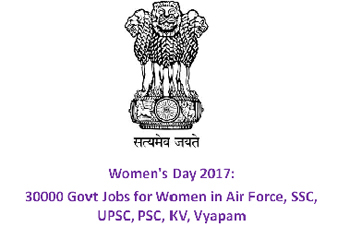 Other government organizations have also made an attempt to provide government jobs to women candidates in various fields. When various job profiles are concerned, government organizations have issued notifications to fill up Teachers, Constables, MTS, Sub-Inspector , Matron jobs, Technicians, Nurses and many other job posts. Every job is women centric and women candidates need to apply for all the jobs listed below. Major job vacancies are published by JSSC to hire Teachers and by HSSC to recruit constables. Vyapam also will fill 2000 posts of Paramedical Staffs’. Other job posts and the entire details can be found in the links pasted below. Job seeking women candidates should make it a point to check the eligibility criteria and last date of application before applying for any post.